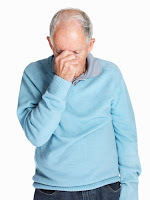 "Memory lapses can be aggravating, frustrating, and even embarrassing," Susan Lehmann of the Johns Hopkins Hospital Geriatric Psychiatry Clinic was quoted as saying in the October 11 Washington Post. "[But] the truth is that occasional memory blips in your 30s—and even in your 40s and 50s—rarely signal a serious problem." But what happens when you reach your 60s and 70s —when do memory blips indicate a concern about development of Alzheimer's disease? Not long ago, leading Alzheimer's experts, under the aegis of the National Institute on Aging and the Alzheimer's Association, came together to answer this question. Alzheimer's should now be viewed as consisting of three stages, they decided: a stage where there are no obvious symptoms, but where noxious changes are already brewing in the brain, or what is called the "preclinical phase"; a stage in which mild cognitive problems emerge, but daily functions can still be performed, or what is called the "mild cognitive impairment phase"; and a stage in which a person meets clinical criteria for a probable diagnosis of Alzheimer's, or what is called the "Alzheimer's dementia phase." More information about these guidelines can be found in Psychiatric News at http://psychnews.psychiatryonline.org/newsArticle.aspx?articleid=108666.